Preheat the oven to 160°C/ 320°F. Cut bell pepper, zucchini and egglant into small cubes. Slice onion and leek thinly. Marinate the sliced vegetables in a large bowl with olive oil, mint, a crushed clove of garlic, rosemary, thyme, salt, and pepper. 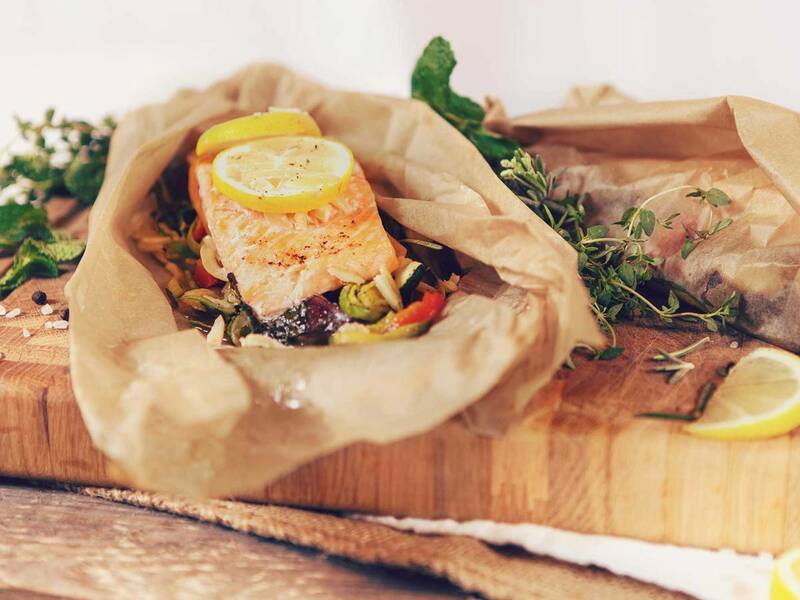 Distribute the vegetables over two sheets of parchment paper. Cut salmon into portions and place on top of the vegetables. Sprinkle with salt and almond slices. Place some lemon slices on top. Fold parchment paper over and cook in oven for approx. 20 - 25 min. at 160°C/ 320°F. Cut the parchment paper open at the top and open slightly to serve.